Those step-by-step blog posts where there are 20 photos of an egg being beaten into a bowl of something, then the bowl, then an oven shot, and on and on and on……just ugh. It takes 20 minutes to find the damn recipe. I’ve tried to keep my musings free of the sausage making photos, but I had to share a few in this instance. Because, well, bacon penises. 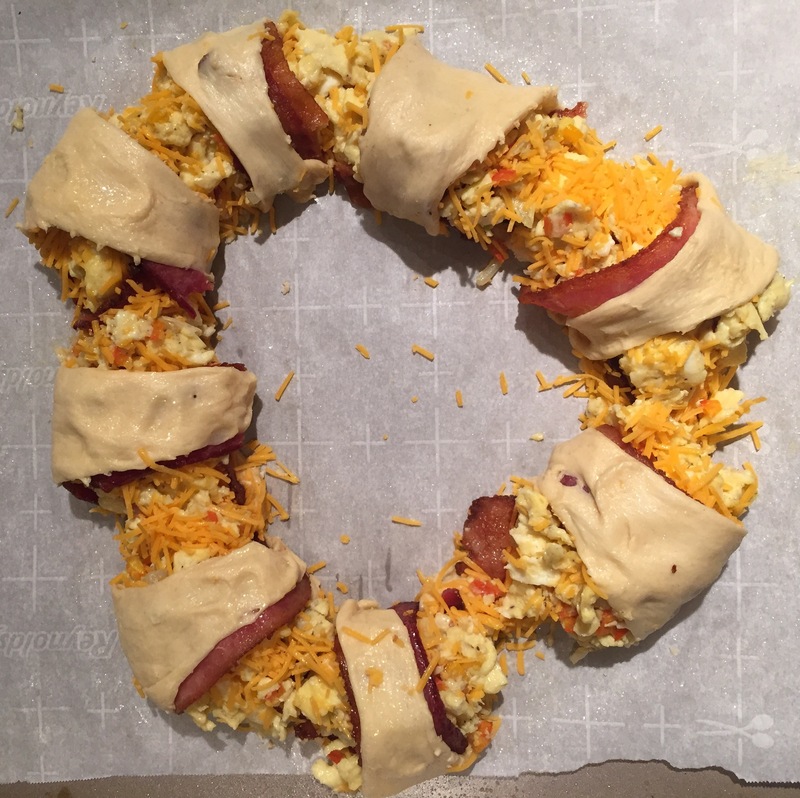 I was assembling a breakfast ring for the Chap’s parents who were visiting and noticed this looked rather suspicious…possibly phallic…until I added the cheese. Bacon penii with cheese…ahem… Hair. Hilarious. Anyway, thanks for making it through the photos. Now here is one easy brunch recipe that will also put a smile on your face as you deal with the stress of prepping for company. Scramble eggs with onion, peppers, salt and pepper. Cool a few minutes. 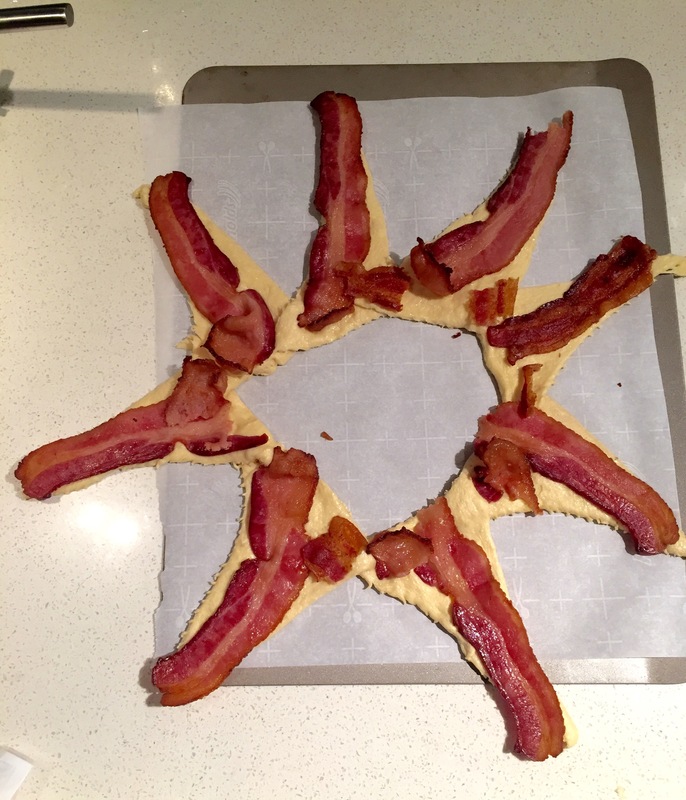 Arrange croissant triangles in a star shape on a sheet of parchment. Place one bacon slice on each triangle. Tear off longer bits of bacon and sneak elsewhere onto the croissant. 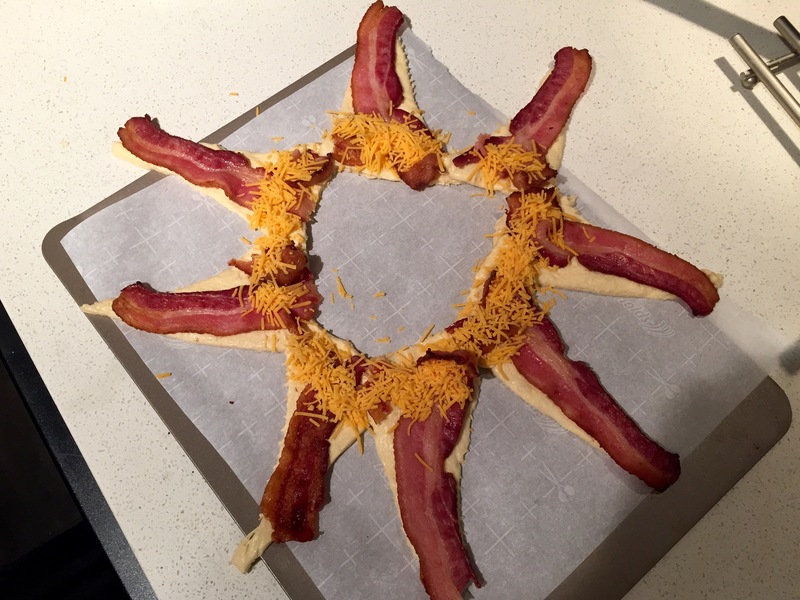 Top bottom part of croissant with 1/2 c shredded cheese, making a ring shape. Spread scrambled eggs on top of cheese. Sprinkle remaining 1/2 c of cheddar. Roll up long croissant “star points” and tuck them under the eggs to secure. Slice between croissants with pizza cutter and enjoy. * This can also be made the night before and baked the following day. Previous Post Worst Movie Ever?